With the modifications to the motor, the turbocharged YZF-R15 makes 22.9 hp of power. 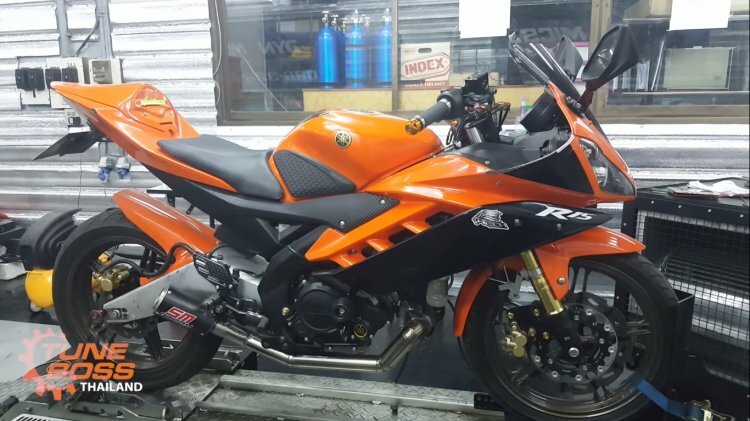 In comparison, the standard bike, which has been replaced by YZF-R15 V3.0, made 16.8 hp from its 149.8 cc, single-cylinder, liquid cooled engine. Apart from the modifications to the motor, the Yamaha YZF-R15 from Thailand gets massive visual upgrades. Adding a sportier look to the package is the rear-cowl that replaces the pillion seat. The pillion footrests have been removed too, thus reducing the weight of the motorcycle. The design of the fuel tank has remained unchanged, but there has been an addition of grips on either side. The brake and clutch levers have been replaced by adjustable, aftermarket units to tailor their position according to the rider’s preference. The stock instrument console has been retained although the cockpit also features a voltmeter and a gear indicator. The braking department has also received an upgrade, and the stopping power now comes from petal type discs on both ends. The turbocharged Yamaha YZF-R15 V2.0 is indeed a commendable job that takes the fun factor to a new level. Regular readers would have read our report on the souped-up Yamaha YZF-R15 V3.0 that hits 16,000 rpm. This motorcycle, which belongs to YouTuber Abhinav Bhatt, has undergone a massive mechanical upgrade to boost the performance. The turbocharged Yamaha YZF-R15 V2.0 makes 22.9 hp of power (v/s 16.8 hp) and hits 180 kph (speedometer indicated) top speed. Meanwhile, India Yamaha Motors is gearing up for the launch of the MT-15. The naked roadster version of the YZF-R15 V3.0 would extend Yamaha’s product portfolio in the Indian market and compete against the likes of KTM 200 Duke. The MT-15 is expected to arrive in the INR 1.60-1.70 lakh (on-road) price tag. It would draw power from the 155 cc, SOHC liquid-cooled, 4-valve, fuel-injected motor, feature VVA (variable valve actuation) of the YZF-R15 V3.0.